Ireland's manager Giovanni Trapattoni looks dejected in the closing moments of the game. AS IS THE case with most of Ireland’s demoralising losses these days, last night’s dreary defeat by Sweden was met with the naïve claim that Ireland lack the players to make an impact at international level. The assertion glosses over three crucial points — 1. Trapattoni has not once during his management picked the best team or squad that was available to him. 2. His tactics often fail to get the best out of players and 3. The general standard of international football these days is fairly underwhelming, so any team with some degree of talent and a well-organised set-up should, at the very least, consistently challenge for the top spot. Firstly, while Trapattoni will correctly point out that he has belatedly given exciting young players such as Seamus Coleman and Marc Wilson a chance, his selection policy remains woefully inadequate. There were several stark cases last night. When Shane Long looked as if he may have had to come off injured, Trapattoni gave Conor Sammon a call from the bench. As admirable as Sammon’s work ethic and attitude is, he patently lacks the quality to have a major influence at international level, as his few appearances in a green shirt have already demonstrated. Moreover, had Long gone off injured, Sammon would have had a full 60 minutes of game time, when he has yet to even complete an entire half of football in the Championship this campaign. Granted, Ireland undoubtedly have their limitations, but to suggest that their best alternative up front in a make-or-break qualifying match is a Derby County reserve striker constitutes an insult to the intelligence of every football watcher in the country. Playing Jon Walters in his preferred position would have been a much better option, as would selecting Anthony Stokes who, as Ireland’s only representative in the Champions League this year, surely merits a place in the squad at the very least. Even Kevin Doyle, who probably saved Trapattoni’s job with his last-gasp heroics earlier in the campaign against Kazakhstan, is a far superior player to have in reserve. And attack is not the only area where Trap has failed on the selection front. Damien Delaney, a player in better form than any other Irish defender in the Premier League, has been ignored, with others such as Darren O’Dea and Paul McShane, who have both conspicuously underperformed at international level in the past, preferred in the squad. Admittedly, it’s unlikely that the aforementioned players would have made the first XI, but there were others omitted who should have been in the team. One of Ireland’s big problems in recent times has been scoring, so an obvious potential solution to the problem would be to play Robbie Brady, who has a knack for producing spectacular strikes and is one of the country’s most promising young players. Instead, the Italian opted to pick James McClean — a player who has been out of form for a year and whose career is on the slide — and Jonathan Walters — a tireless worker, but someone who looks patently uncomfortable when placed on the wing. Similarly, the rejuvenated Keiren Westwood was ignored in favour of Championship journeyman David Forde, who could have done better for at least one of the opposition’s goals. And Glenn Whelan, who looked off the pace all night, was indulged, while Darron Gibson was sitting at home wondering what might have been. Moreover, though there was a strong case for two strikers at the start owing to Sweden emulating Ireland’s 4-4-2 formation, it soon became clear that an extra man was still needed in midfield, which is why the failure to introduce Wes Hoolahan (not for the first time) was completely baffling. Bringing on the Norwich man at half-time would have represented a signal that Trap knew the game was turning in the Swedes’ favour, and that Ireland needed to combat this problem by altering their style. Instead, his team remained the same, thereby sending out the wrong message to players and fans alike, and so unsurprisingly, the momentum shifted even further in Sweden’s favour thereafter. An equally stubborn mindset has permeated every Irish performance since Trapattoni took over, and this overt caution and refusal to change his system, which is effectively a formula based on fear and mistrust of players, has produced an almost inevitable consequence — Ireland have not once beaten a team ranked above them in the 74-year-old’s five years in charge (unless you count the 90 minutes of the second-leg play-off against France). When you assess all the key decisions the Italian has made — only urging his team to attack in the second leg against France, sticking largely with the tried-and-trusted players for Euro 2012, bringing on Paul Green rather than Wes Hoolahan against Austria — each choice has been based on an innate obsession with caution, which has ultimately cost Ireland dearly on all the aforementioned occasions. Though most would point to Euro 2012 qualification as evidence in his favour (and there is no doubt he deserves some credit for such an achievement) — any manager with Richard Dunne in peak form and Robbie Keane as prolific as ever would have had a strong chance in his position, especially after drawing as inept a team as Estonia in the play-offs. And that brings us to the last point — the supposed strength of international football. Sceptics last night suggested that Ireland were simply not good enough to beat Sweden. But if this were the case, why did Trap’s side look the better outfit for large sections of the corresponding fixture between these two teams in Stockholm? Indeed, with Andreas Granqvist and Kim Kallstrom both featuring, they arguably had a better team then, when compared with yesterday evening, amid a game in which Ireland were one or two near-misses short of coming away with three points. In fact, one of the most disappointing aspects of yesterday’s match was that Ireland were beaten by a fairly mediocre team. True, Sweden have a world-class striker in Zlatan Ibrahimovic, but in other areas, Ireland are ostensibly stronger. For instance, in midfield, James McCarthy –Everton’s new £13million signing who is one of the most promising young players in the Premier League — came up against Andreas Svensson, a 37-year-old who has played in the Swedish league since 2005 and who hardly set the world alight during his four-year stint at Southampton. Meanwhile, their left winger, Alexander Kačaniklić, has struggled to break into the Fulham team ahead of Damien Duff, and was sent on loan to Burnley last year. Moreover, Ireland’s defence had three regular Premier League starters and Richard Dunne, whereas Sweden’s backline consisted of players from the likes of Blackburn and Celtic. So to suggest that they are a class above the Irish team somehow; seems fanciful at best. And indeed, even if Sweden were superior, there is nothing to suggest an effectively organised Irish team couldn’t overcome such opposition on home turf. After all, Switzerland got the better of Spain as recently as the 2010 World Cup, while just last night, Estonia drew with Holland and Northern Ireland came close to pulling off a second consecutive shock against Portugal. Therefore, the perpetual defence of Trapattoni is that he is getting the best out of the limited players at his disposal, yet if this were the case; the performances would not continually dip whenever the team played at home, and players such as Darron Gibson would be turning out regularly. 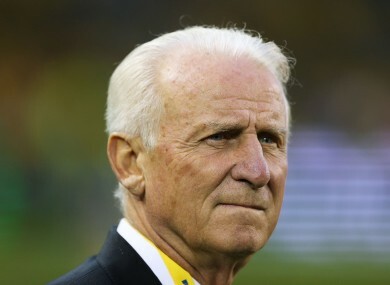 So in fact, the opposite is true — Trapattoni has exacerbated a difficult situation by failing to regularly play his best players and employing tactics that are not conducive to his side’s strengths, while somehow ensuring the team invariably performs to a superior level in away matches. Accordingly, though these criticisms may appear to be minor qualms in isolation, when added together, they suggest a man who is no longer up to the task of holding as high-profile and important a position as national team coach. While he deserves commendation for restoring order to Irish football following the shambles of the Staunton era, it seems highly unlikely that he can now take this team any further. Email “Opinion: Ireland have the players to qualify for the World Cup, just not the manager”. Feedback on “Opinion: Ireland have the players to qualify for the World Cup, just not the manager”.